BS EN 13914-1:2005 - External Rendering. 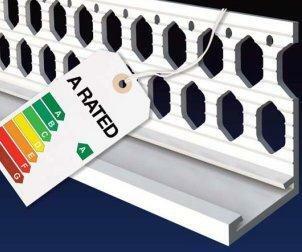 Renderplas beads comply with BS EN 13914-1:2005 the European Standard for External Rendering.. Publication in March 2005 of the European Standard for External Rendering is a ‘must read’ document for architects, and specifiers as well as renderers and plastering contractors involved in external rendering. At first glance, the 50 pages of Eurospeak from the committee responsible, which took 5 years from its original draft to approve and publish, it might appear to the experienced plastering contractor not to contain too much that they don't already practice. For the less experienced contractor, there is a word of warning that they would do well to heed. This centres on the choice of beading available to them. Specifiers will now have to be much more vigilant over the selection of beading used for external rendering, as the Standard signals alerts over the presence of salts in the atmosphere or background which could result in corrosion. BS EN 13914-1:2005 stipulates that specifiers and contractors have two main choices of beading. These are either PVCu or stainless steel. The use of galvanised steel is permitted, albeit heavily qualified with regard to the level of salts, which it does not attempt to quantify further. It would, therefore, be a brave decision to permit their use, as there is significant ‘wriggle room’ for the client when corrosion occurs. In any case, PVCu beads are the more cost-effective option, as galvanised beads must now be hot dipped after manufacture, greatly increasing costs. It has been common practice on the Continent to use dedicated external beads for many years and, more recently, most builders merchants in Ireland offer a PVCu option. The UK, however, has been slow to adapt to the reality that corrosion can and should be prevented. This will certainly change during the coming months, as building contractors will be obliged to ensure that rendering conforms to the new standard. The plastering trade well remembers when Tony Pidgley of Berkeley Homes went Back to the Floor on BBC2 and was staggered that the plastering contractor had used internal beads in a rendered column. These rusted even before the handover. Who bears the responsibility to ensure that the new standard is applied? It was alarming when 200 architects’ practices were surveyed recently, that a high proportion left the choice of beading to the contractor. Many admitted to having had corrosion problems on their projects. Whether the architect or the contractor takes the initiative, it is plain that the client now has a potential claim if BS EN 13914-1:2005 is not applied. It is therefore vital to be engaged in the specification details to ensure the Standard is complied with.